You know what I love? Gift cards! They are like the gift that keeps on giving... I mean really, I get excited when I see that I was given one, and then I sit on it for a few months, and get a second dose of excitement when I actually end up buying something with it! For my second wedding anniversary (which was June of last year...), my dad and mom gave us a Crate and Barrel gift card. When I finally decided it was time to use it (which was only a week ago), I came across the coolest linen napkins. Although we ultimately decided on something else (we went with a few picture frames instead), I was still swooning over the bright colored napkins. So, needless to say, I decided to DIY (the Crate and Barrel ones were originally $13/napkin anyway... so I had some heartburn paying over $100 for a set of 8 napkins). How fun are these napkins set with this table?! Although having all of that stuff on the table isn't functional for actual eating, it certainly looks beautiful in pictures! 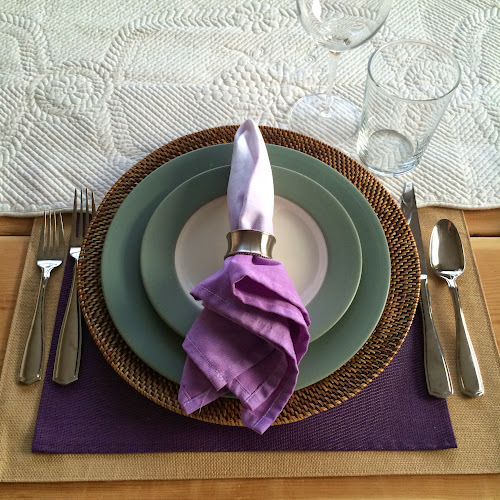 I thought the pop of color wasn't overwhelming, but definitely fun for a spring or summer table setting. My napkins didn't turn out quite as vibrantly as I had hoped, but I think had I let the color soak for a bit longer, it would have stayed brighter after washing. All together, I was quite happy with the end product (especially considering a set of 8 DIYed was just about as expensive as one from Crate and Barrel)! 1. Cinch the napkins with a rubber band, dividing the areas that you want to dye from the areas you do not want to dye. 2. In a small bowl, combine 2 cups of hot water, 1 cup of salt, and the package of powered dye. Stir until dissolved. After dissolved, pour the mixture into a bowl or bucket of hot water. 3. 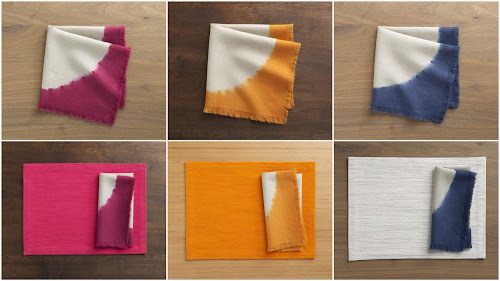 Wet the portion of the napkin that you want to color in hot water (it is important to first wet the napkin with hot water so that once dipping in the dye, the dye will absorb evenly). 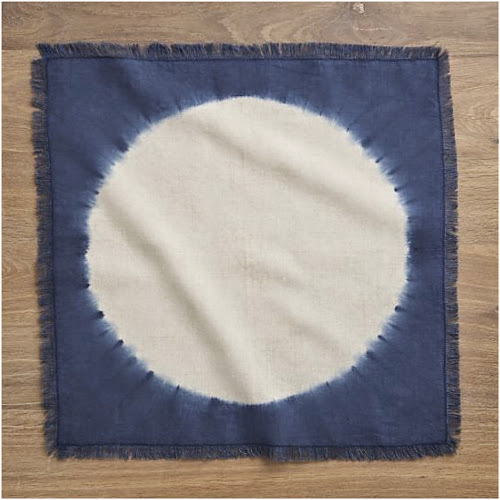 After wetting with water, dip the portion of the napkin that you want to color in the dye. Dip and dunk for about 5-10 minutes. 4. 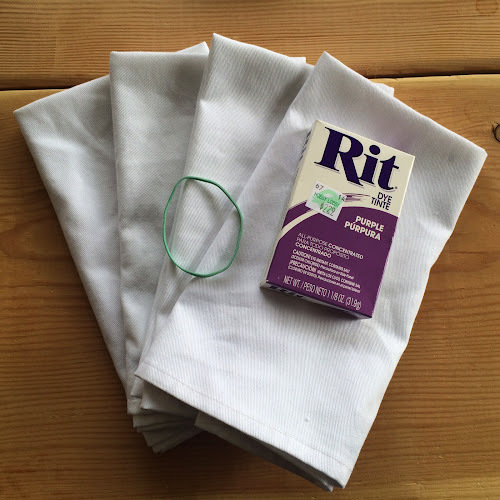 After dyeing the napkin, place the napkin on wax paper to sit for 30-45 minutes. Take care to not get any dye on the portion of the napkin that you want to remain white. 5. After the napkins have soaked for 30-45 minutes, rinse all of the dye out in the sink. It is important to get all of the dye out so that once you wash the napkins in the washing machine, the color won't bleed (I could have done a better job with this on mine). 6. 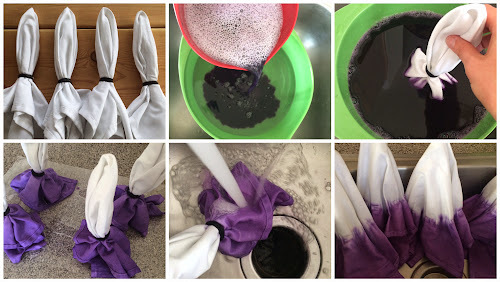 Once the water runs clear and there is no more dye in the napkins, remove the rubber band and wash and dry in the washing machine using cold water. After washing my napkins, the purple color bled a bit into the white, but they still turned out nicely. Also, my line of color-to-white was not quite as crisp as the napkins from Crate and Barrel, but I think had I used a linen material this would have not been an issue. Great job! I love these. Perfect for a spring table! As usual your DIY projects put anything I do to shame!! I cant remember the last time I did tie-dye with anything - but this makes me so happy!! oh my gosh these napkins are so perfect, i wish i had known about this for my wedding, love this DIY! Love it! And it looks so easy! These will look gorgeous for Easter. Oh my gosh, how awesome. Love these! So cute!! And seems so easy! These are so awesome! And I love your table setting! LOVE! Wow! Those are so cute!! They look pretty easy to do too. Great job! They turned out great!! gorgeous! Someday we are going to meet up and craft! bahahahha I was literally about to say this post reminded me of when we got to tie-dye tshirts back in the day and that was like literally the most exciting thing ever for me! 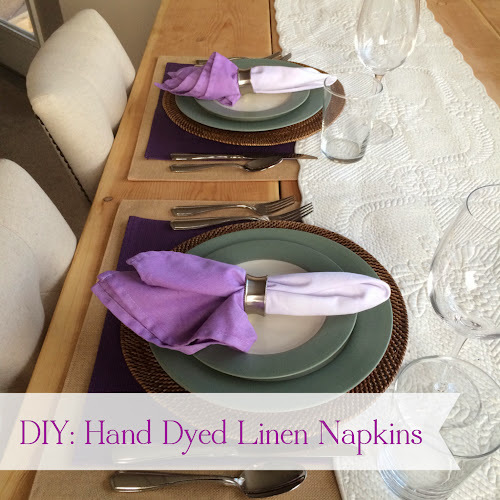 I really love this DIY and those napkins came out beautiful! I CANNOT get enough of your DIY projects! Loving these! I have officially declared you the DIY queen my dear friend! You are amazing.Such a great idea! love it, much love! Wow, these came out sooo cute! Perfect for an outdoor summer dinner table! Love these!!! Such a fabulous DIY. And honestly, I think your's turned out MUCH better. The lavender just screams Spring but will also very much carry into Summer! Bravo! Well this looks pretty darn cute and simple! You could do this for all holidays/seasons! Love it! Love the way those napkins turned out!! What a great idea! 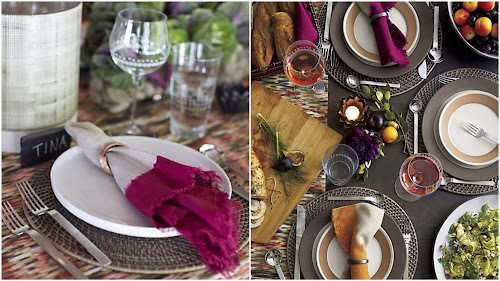 Such a great way to add some color to the table settings. Incredible! I love this! BTW, I LOVE gift cards too! I got mostly gift cards for my shower and I'm keeping them all in a binder. It's nice when D or I want something to be able to whip out the binder and go get whatever we're needing/wanting. So far, we've gotten a picture frame, food processor, and oil mister since the shower. It's nice not having to spend your own money! lol. Love these!! They make your place setting even more pretty!! Pretty!!! I love this, I booked marked it for future crafting. I love that they turned out ombre! So pretty!